Will your class escape in time? Try this escape room style game with your students today! This is a fun game that is perfect for the winter months. The focus on this game is facts and opinions as students learn about snow. 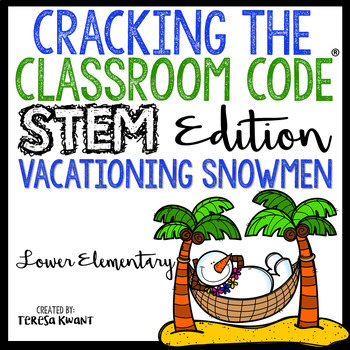 Then, the STEM challenge has students building a catapult to help the snowmen get from the beach, back home to the snowy mountains. This game is perfect for the lower elementary grades 1st-2nd. This lower elementary version has a lower reading level, and some clues have been changed to be easier. This game is unique from my other escape rooms, because it focuses on STEM. Students will be learning about snow, as well as designing and engineering a catapult. This is an interactive game where the students are timed. Students are trying to construct a catapult to help the snowmen return to the mountains from their beach vacation. Students will have to solve a string of questions and clues, as well as decode different ciphers to escape. If your class has never played an escape game before, I suggest playing this as a whole class. For lower elementary, I highly suggest that this game be played as a whole class.